Super exciting news, continuation of the ‘labels for textiles’ debate and a handful of felt berets!!! Well, I can almost not speak or write today I am so excited, drumroll please! The biggest news I am sharing with you today is that super friend and felt hat maker extraordinaire, the wonderful Dawn Edwards will be coming to stay at Clasheen during April 2012, I can’t wait!!!!! This trip has been a long time in the planning, almost 2 years to be exact. Finally Dawn has her first ever passport, some provisional dates in mind (the 2nd, 3rd and 4th weeks in April) and as soon her current fairs and events are over Dawn will be booking her tickets. Watch out Ireland, here she comes!!! I’m going to be blogging loads about Dawn’s trip over the next few weeks and also revealing news about my own Spring trip across the water, KY are you ready??? For the moment however ‘A Taste of Carlow’ looms on the horizon, I’ve been invited to participate in the Borris Farmers Market over the next 4 weeks, loads of felting needs to be completed to display at these venues and mum is being discharged from hospital today but still has loads of tests, scopes and consultant visits to go through over the course of the next two weeks. Thanks so much Sonia, Deb, Suzanne, Dawn, Ellen, Margaret, Chrissie, Margo, Lebec EGirl (sorry I can’t work out your actual name! ), Shirley and Pam for leaving comments about the ‘labels for textile art’ debate! I am thrilled to get your input as it really opens up the issue and has given me plenty of food for thought. It’s interesting that Shirley suggested signing the mount board on the bottom right, I did debate doing that but ended up not, would one use a pen or pencil for this??? Shirley also said about keeping the bottom border about 1/2″ deeper than the others, I didn’t do this unfortunately but it totally makes sense if you are signing the board! As to stitching directly on the felt or adding initials by either needle felting or sewing, like Suzanne while I can sew if really pushed it doesn’t come naturally and I’m really looking for a simpler solution that totally shouts ‘me’. Obviously I am stretching myself since I purchased my beautiful straight stitching sewing machine but I don’t feel comfortable or confident enough at the moment to sign with free machine embroidery. Also for me, the felting is my favourite part of the process so I think I’m going to stick with adding a label onto the back of my work in future coupled with signing the mount as suggested in the front. At the moment I am ironing my new basic labels onto the back of my work as opposed to sewing them in and it does seem to be working although I would definitely like a more distinctive label. I love Margo and Deb’s idea of a metal label, adore the little silver tags that Chrissie makes and uses herself and also love the little wooden tags Heather sews inside her felt bags etc., these are definitely options to consider in the future! Yesterday evening when I got home from visiting mum I decided I just couldn’t face in to felting more flowers. I am up to date with the target I set myself of having a minimum of 57 flowers completed in time for Sunday so decided instead to have some fun and start working on a few soft and colourful felt berets! Below is a picture of the first one I completed, beautiful short fibred merino, a swirl of silk chiffon and loads of hand dyed silk hankies on top to provide sheen and bring the turquoise and green colours together. I’ll be bringing some of these berets to the farmers market on Friday and also to Carlow on Sunday afternoon if I still have any in stock! I created an event page on FB this morning to promote ‘A Taste of Carlow’ so do please share this with your friends if you use FB. We would love a big crowd to support all the wonderful Carlow artisans who will be participating on the day (Sunday 4th December, 2 – 6pm) and I just want to let as many people as possible know that the event will be happening! Yesterday I finished felting a series of felt landscapes which I am hoping will be selected for inclusion in the Blueprint Christmas Exhibition, fingers crossed please! It was one of those days when everything seems to go right on the felting side of things, the velvet crinkles wonderfully when felted with the short fibred merino and the simple white frames and off white mount show off the landscapes just to my liking. Of course that doesn’t mean the people curating the exhibition will feel the same but at least I am happy with what I produced. My new lables also came in handy as I was able to attach one to the back of each piece of felt, that leads me to the question, what is the best way to sign a framed piece of textile art? Any suggestions eagerly awaited! 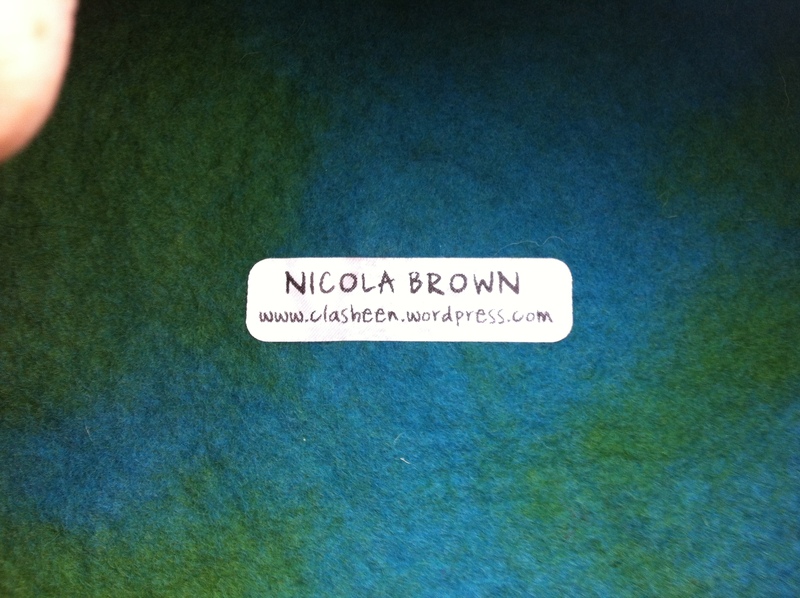 Thanks ….. and leather handles for felt bags! Thanks so much to all of you who have left comments, sent emails and rung me to wish my mother the best. Yesterday it was confirmed that she has a very rare disease primarily affecting the muscles, only 9 in every 1,000,000 people suffer from the condition. At the moment she is somewhat of a medical celebrity in the hospital because in the last 7 years no patient has presented with the symptoms! I will probably not get too much paperwork done over the next few days or many emails answered so apologies if you are waiting for a reply, I will get to read everything all going well just no time to think clearly and write the replies. Do you think that I can forget the housework too??? Yesterday I felted another 9 flowers for the ‘Taste of Carlow’ event and now I need to add buttons and finish some of the bags and purses I felted last week. I did have an idea of approaching a wonderful Kilkenny leather craftsman and asking him to make some special handles to my designs, maybe next week I will get time to pop down and have a chat with him. Failing that I probably need to order handles online from Homestead Heirlooms. I love the work these ladies produce and stocked up on handles last year when Heather and I attended the amazing Duchess County Sheep and Wool Festival at Rhinebeck! I’m felting like crazy now in order to have a nice supply of stock for the craft fair on December 4th. Taking the descision to limit my range of products has been beneficial I think, I’ve decided to concentrate on flowers, a series of bags/accessories combining raw wool and merino and lastly several framed landscapes. Also mum is not well at all now and I need to work whatever hours I am not visiting her in Dublin. Yesterday I drove her up there after discovering her own GP was away and the blood tests he ordered last week not back from the lab. She was seen really quickly by a triage nurse then the ER consultant, had an ECG and chest a X-ray and then was admitted into hospital. We saw the consultant neurologist last night and today she in undergoing a barrage of tests to confirm the preliminary diagnosis. Over the last few weeks her muscles have got a lot weaker than usual and several other slight but unusual indications lead to the conclusion she may have a very rare disease, we should know more today or tomorrow. For now I’ll leave you with an image of some flowers, sorry the colours are not hectic, the sun was shining too brightly at Clasheen this morning!!! Little felt brooch tutorial as promised! You may remember that I promised to post (especially for Fiona!) a felt brooch tutotial, these were was what all of us in Feltmakers Ireland were teaching during the ‘Learning Curve’ sessions at the Knitting and Stitching Show in Dublin last week. Thanks Holly for giving me permission to share your instructions, here they are in my own words as an abbriviated list, I am assuming that everyone knows how to lay out the fibre but if not please refer to my basic flat felt instructions over on the tutorial page. For these brooches we worked between bubble wrap and used beautiful short fibre merino batts, of course you could use tops/roving but the batts are just so quick and easy it’s not funny! Anyway, don’t be afraid to experiment with the dimensions and fibres/fabric that you use, here is the process …..
Lay out a 10cm (4″) square of one colour, wet out with soapy water and fold in the edges to make more even, put aside. Lay out an 8cm (3″) square of a complimentary or contrasting colour, wet out and fold in the edges as above. Place the smaller square on top of the larger and position a round or oval resist on top somewhere making sure to leave some space around the outside to allow you to trap it completely with wool. For my resists I like laminate floor underlay best but any kind of flexible plastic eg. bubble wrap is fine. Cover the resist totally with a couple of layers of wool, add in blobs of other colours randomly remembering that a clashing colour often provides an interesting point of contrast. Place a piece of fabric on top, we used muslin or scrim, and lightly wet. Roll a few little pieces of merino in your fingers and position them as surface decoration, circles or crosses look good I think. Rub your brooch between the two layers of bubble wrap for 5 minutes on side one, 5 on side two and 5 on side one again. For the purpose of the workshop I just asked everyone to count out 300 rubs X 3, easy peasy! Just check once or twice to make sure that it is both soapy and wet. After 300 rubs remove the brooch from the plastic and rub it in your hands. If you are using the short fibred merino you can get quite aggressive at this stage, it only will take a few minutes to full and finish it. Once it has shrunk by about 1/3 cut a small cross into the top of where you positioned your resist, push and seal the cut edges outwards with your fingers. Remove the resist, rinse and stretch the brooch into shape. Stitch on a brooch back and wear with pride! On a larger scale and with a different design these pieces make wonderful framed landscapes, pressies anyone??? 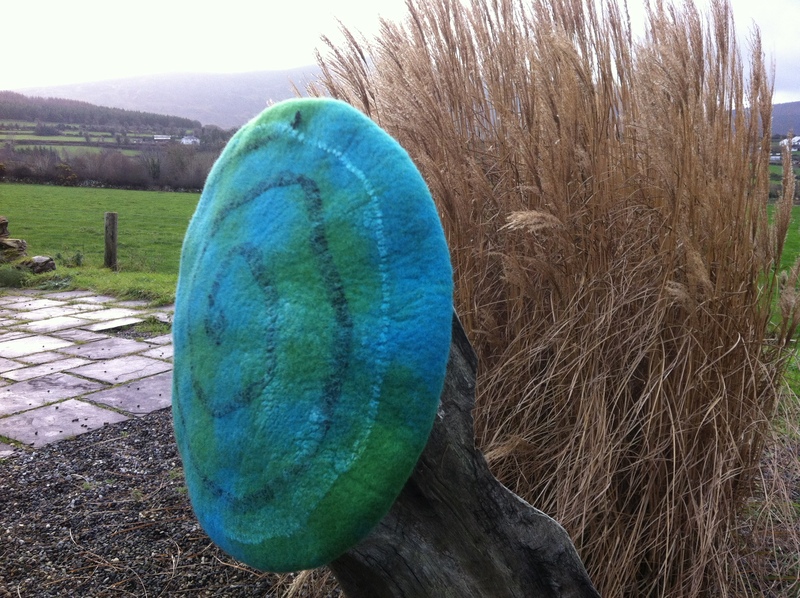 Felting production underway as I really want to wow everyone in Carlow on 4th December! I finally took the plunge and have booked a stand for the ‘Taste of Carlow’ event happening in Carlow town on Sunday 4th December. This artisan craft fair will be restricted so that ALL the artists and producers present are guaranteed to come from Carlow town or the surrounding county. If you would like to support local small businesses, me included, please do come along and say hi on the day! It would be wonderful to see everyone buying their presents and festive food locally, we really need your support to boost our Carlow and Irish economy!!! From now on I have a plan of action in place and will be felting like crazy to have enough good quality items for my stand and from my studio here at Clasheen. Last night I felted some flower brooches with stamens, this morning I am working on a merino and local Jacob’s wool shopping bag with inside pocket and am planning to release a pattern for this bag if it works out the way I am hoping. Last night I designed and printed gift vouchers for felting felting workshops and over the next few days I will be writing up a tutorial for some simple beginners items and packaging them with the necessary raw materials to make up little diy kits for pressies! Thanks Chrissie for your helpful advice re. time and house managment, hopefully I have started as I mean to go on!!! If you click on the link below it will bring you thorough to a pdf file listing all many events in the county over the next 6 weeks as well as links to accomodation if you are travelling from outside the area. ‘Taste of Carlow’ and other seasonal events happening to celebrate Christmas in Carlow! 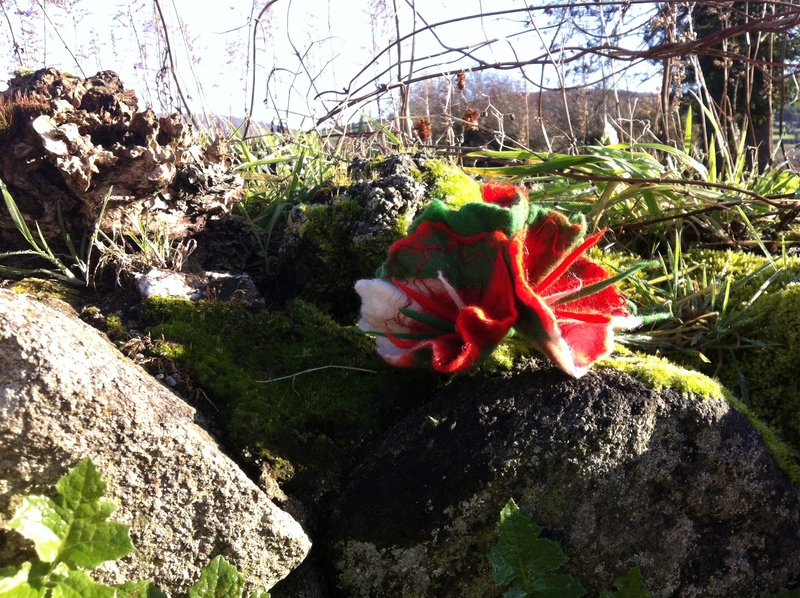 Felt, fibre and other art related highlights from the last few days! I’ve spent an action packed, satisfying but tiring long weekend in Dublin and am going to jot down some of the highlights here for you to peruse. Things kicked off on Thursday morning when I delivered a workshop titled ‘Using Social Media to Promote/Sell your Craft’ as part of the Crafts Council‘s ‘Craft Enterprize Programme’. I met a great group of dedicated crafts people and hopefully they had as much fun as I did and learnt something new to help their business from what we were discussing! The venue for this workshop was in the Dodder Rooms at the RDS and convieniently the Knitting and Stitching Show 2011 was also held at the RDS, this time across the road in the Simonscourt Arena. As well as old favourites like The Yarn Room, Art Van Go, and Jean Oliver’s stand with beautiful hand dyed raw materials, stands, exhibitions and events from the show that I really enjoyed included ……. 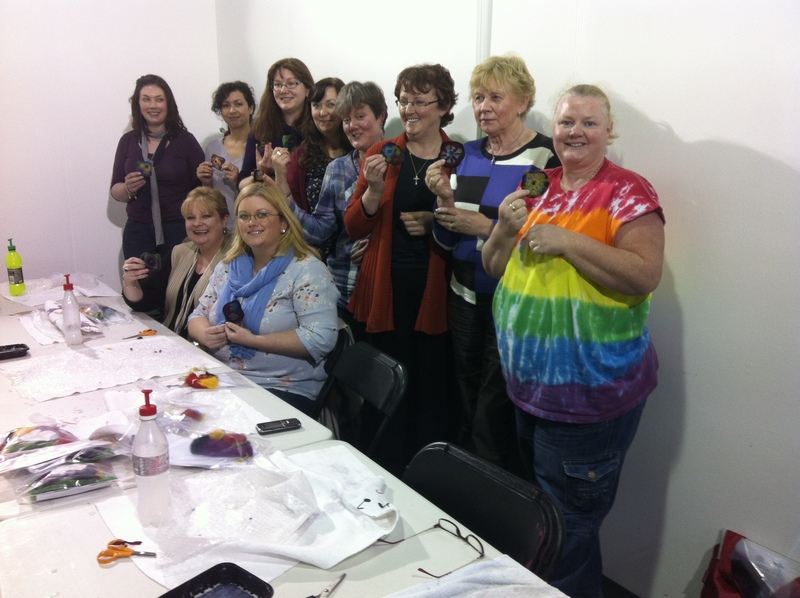 Feltmakers Ireland – it’s always wonderful to see the expression on faces as people discover the magic of wet felting for the first time! Seascapes – an excellent curated textile exhibition put on by the Crafts Council. 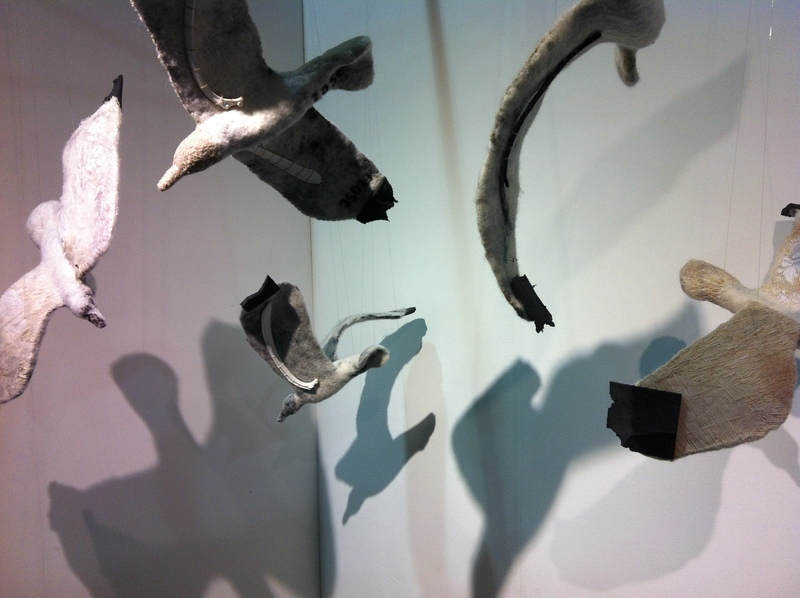 I thought that Caroline Schofield’s ‘Scavangers’ were particularly stunning, 5 swooping sea gulls which projected amazing shadows onto the walls! Facilitating the Friday session at ‘The Learning Curve’. Thanks ladies, I really enjoyed your company and hope you love your new felt brooches! On Thursday evening Alan and I walked to the opening of our friend Anthony Lyttle’s exhibition ‘The white mark’ which is running in the Cross Gallery until 3rd December. This gallery is at 59 Francis Street, easy to walk to from the city centre and Anthony’s beautiful exhibition is well worth a visit if you are in the area! On Friday evening we both walked into town again and had a brilliant time at the launch of ‘Profiles in Felt, a Feltmakers Ireland book published after a LOT of hard work and with help and support from the Crafts Council. Congratulations to the team involved in making this book happen, the result is truly wonderful and Sonya Lennon was an inspired choice to speak at the opening! Champagne and cake helped with the bubbly atmosphere and it was such fun to meet with many of the 44 felters profiled in the book!!! Whew, I’m just about out of time again so suffice to say the weekend progressed! On Sunday I helped good friend Eileen MacDonagh by starting to cover one of her current amazing sculptures with papier machier (more in another post, 15 HUGE trees!) and last night we went to a screening of ‘The Way‘ at Visual, a great night. Coming in a post soon for those who have asked, a quick little glimpse (thanks Holly!) 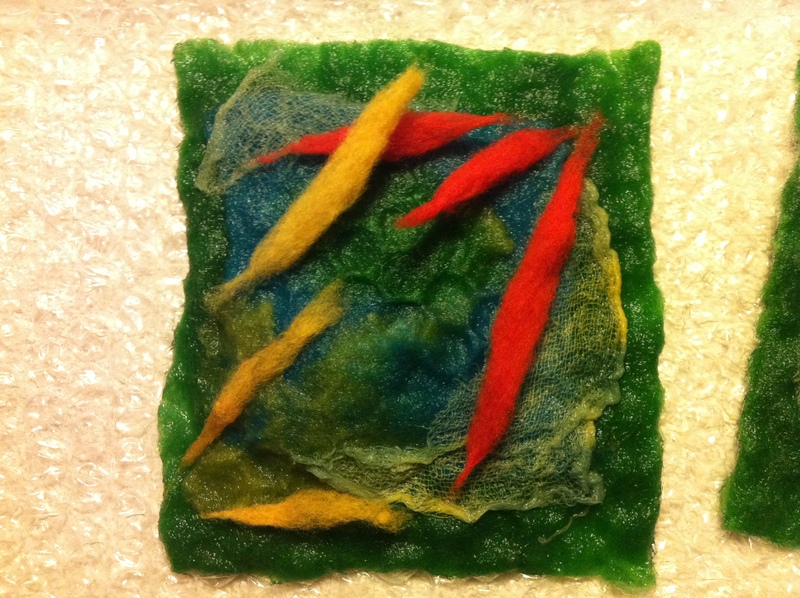 about how the brooches were felted during the learning curve experience!